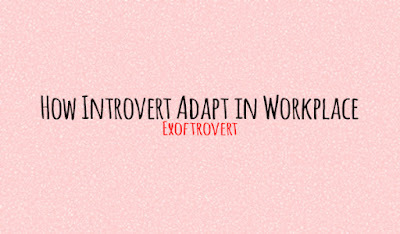 How Introvert Adapt in Workplace - Everyone is excited because Dak Prescott's amazing touchdowns, and maybe some of you feeling great like Kanye West who calls out Beyonce in Onstage Tirade, and maybe just happy because tomorrow is Monday!! Yeaah 👯 Everyone is back to work! So, for your tidy Monday I'll write about workplace. Some Introvert will never have a partner in their workplace, or, it can be wrote as difficult place to have a partner. Here are some situations Introvert will face in a workplace and how to deal with. Maybe you think it's too late to start a relationship when everyone in the place of employment already know each other. And sometimes, the dynamics like that just as simple as taking the time to go through this period with related. Just push yourself to find something to talk with other and smile. How Introvert Adapt in Workplace. It turned out that there has been negative rumors circulating about you. Or maybe sometimes we have a situation beyond the limits that make us ostracized by colleagues. If you did make a mistake, immediately redeem those mistakes and do not repeat it again--as simple as that. Being wise is not easy, but you'll find a friend. If in fact you did not do anything wrong, remain friendly and ignore all these rumors and those rumors will gradually fade. It happen every times in our live. Similarly when in high school, there are some situations that require you to cooperate in work where you stand in the group are outsiders. Typically, the group has been formed from long and has strong ties to look like they are not friendly. In fact, you need to be friendly and try to get to know each other individually. It might take a chance event such as a large office anniversary celebrations office, or outing together, lunch time, or else. Establish closeness that starts from trust and support each other. As I say, for introverts, it will be hard if you have to force themselves on someone who has not been known or unknown. When introverts are surrounded by 'foreigners,' they will not hesitate to withdraw. You may be weak, and be unapproachable, deliberately making it difficult co-workers come to you. You've made a sad situation where you're the only one who could handle it. 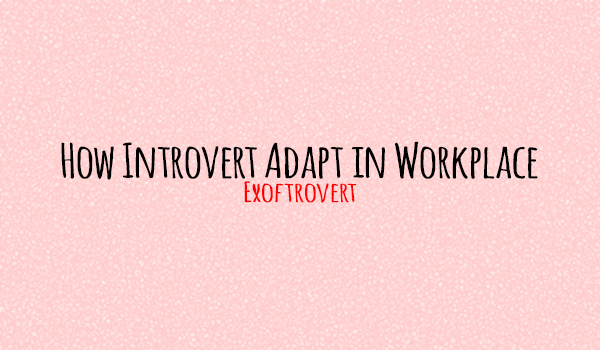 How Introvert Adapt in Workplace. It sounds like a cruel thing but this wasn't a personal matter. We all have values ​​and ways of working that we use like clothes or accessories. They are there to be seen and experienced. But sometimes, when it comes to issues such as work culture, there are some differences experienced by the people who we work. This makes the establishment of the friendship is hard to do. If you do not fit in with the culture, you have to deal with it and make it snappy move on. Because this will not only be giving you a hard to build relationships, but also your career. To make it not seem excessive, focus on one or two people who felt to have in common with you, and try to identify them. It will help you develop themselves and build a good relationship between you and the workplace.